Meet Rosie – the bookworm robot living in Old Town Fort Collins! Meet Rosie, one of Poudre River Public Library District’s hardest working staff members. Named for Rosie the Riveter, this unrelenting worker helps the circulation staff with getting all of your materials back to the right shelves for you to find. If you’ve ever wondered what happens to your books when you feed them into Rosie (automatic materials handler), you may be disappointed to find out that magic elves aren’t involved in the process. But, don’t be disappointed for too long, because Rosie and her helpers may just impress you with a little bit of magic of their own. As you may have noticed, at the Old Town Library, there are two automatic check-in boxes, (one inside and one outside) and one manual drop box. The manual drop box is there for those who don’t want a receipt or to wait for their book to check in. Both drops get your checked-in items to Rosie. But before I can explain the next part, I have to ask you a question. Have you noticed when you open up a book, there is a sticker that says “Poudre River Library District”? That’s the book’s RFID, or Radio Frequency Identification, each unique to each book. That’s why when you check out at Poudre Libraries, you only need to set your books down on the table-top self-checks and our computer automatically knows what books you are checking out! 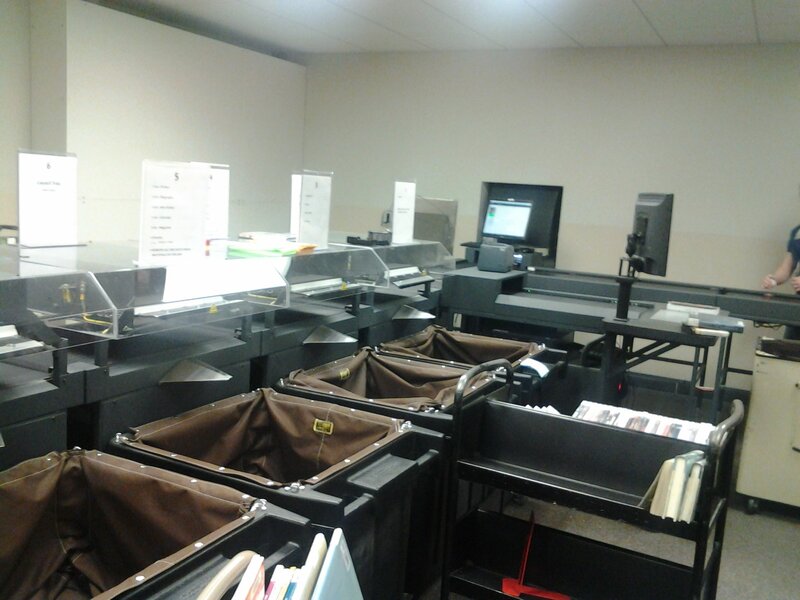 Well, Rosie also can use the RFIDs to check-in your books and sort them for the circulation staff, which saves them a lot of work, and even better, a lot of repetitive hand sorting! Rosie sorts every book, DVD, and audiobook that gets checked back into the Old Town Library into nine different bins. Each bin contains different genres or codes, so circulation staff can efficiently re-shelve them, because the Library District has a floating collection, all the materials that Rosie checks in stay at Old Town Library until someone puts them on hold for pick-up at another location or drops them back off for check-in at a different library. 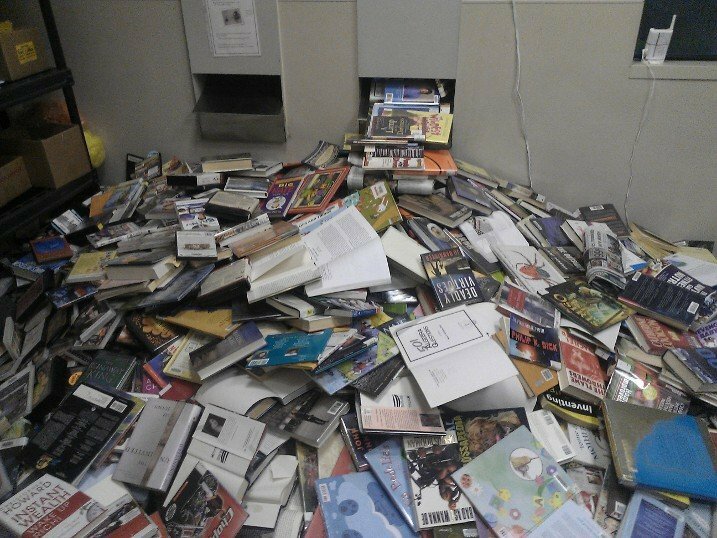 This picture was taken at Harmony Library in the check-in room after the 2 day flood closure, and every single one of those books has to be individually checked in, and then sorted to the right piles which the staff has to take out and shelve. What a difference Rosie can make! However, Rosie is not quite as perfect as she sounds! The workers who use Rosie for manual check-ins find themselves inundated with books they want to read/check out! Every book and DVD that passes through their hands is a temptation! Okay, maybe it really is as perfect as it sounds. So three cheers for Rosie! One of our libraries’ hardest and important workers!